Plants perennial; cespitose, with well-developed, thick, dark rhizomes. Culms 60-100 cm, erect, unbranched. Leaves mostly basal; sheaths longer than the internodes, glabrous, basal sheaths many-veined, shredding into threadlike segments at maturity; collars glabrous or sparsely pilose at the corners; ligules 0.1-0.2 mm; blades 10-55 cm long, 1-3 mm wide, flat to folded, glabrous, pale green to yellow-green, central veins separate and narrow, without a well-defined midrib, lateral veins forming a thickened region on each margin. Inflorescences paniculate, (10)20-45 cm long, 2-6 cm wide; nodes glabrous; primary branches (2)4-15 cm, basal branches appressed, without axillary pulvini, distal branches ascending, occasionally lax or drooping distally. Spikelets appressed. Glumes unequal, brown to chestnut, 1-veined, awned; lower glumes 6-12 mm, awns 2-5 mm; upper glumes 13-18 mm, awns 3-6 mm; calluses 0.4-0.8 mm; lemmas 9-13 mm long, narrowing to a poorly defined beak 1-2 mm long and 0.2-0.3 mm wide, glabrous, tan to brown, junction with the awns not conspicuous; awns usually unequal, not disarticulating at maturity; central awns 15-30 mm, curved to semicircular at the base, horizontal to reflexed distally; lateral awns 13-20 mm, at least 1/2 as long as the central awns, curved or loosely twisted at the base, straight and strongly divergent distally; anthers 3, about 4 mm, yellow. Caryopses 6-8 mm, tan to brown. 2n = unknown. 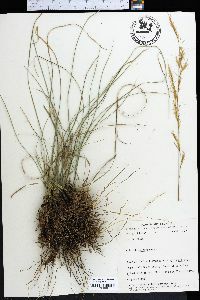 Aristida rhizomophora is not well-collected. It is endemic to Florida, where it grows in moist to wet pine flatwoods, and on the borders of ponds and bald-cypress depressions.